While the AIDC industry is unique in many respects, it is no different from any other when it comes to creating brand recognition. Social media has become one of the most effective ways to spread your brand name and gain influence. 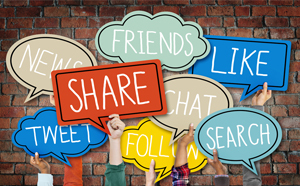 A recent study by VDC Research explored how social media can benefit the AIDC world. Social media offers AIDC businesses an easy way to show potential customers visuals; seeing products in action is often very important. To best take advantage of social media, companies in the AIDC industry should have a social media marketing plan that spans Facebook, Twitter, YouTube, and LinkedIn. With YouTube, you can create how-to videos or digital advertisements for your products, which you can then share on Facebook, Twitter, and LinkedIn; these videos should also be used throughout your website. Facebook, Twitter, and LinkedIn are great for sharing visual information, but remember that each platform is different and each platform’s users might respond differently to certain types of posts. One of the best social media practices is to then track the engagement rates (the number of people who commented, shared, or liked a post divided by the number of people who saw the post) for each social media outlet and see where you stand on the effectiveness of your posts. Use this information to gain a better understanding of each platform’s audience and develop more focused strategies for each one. Don’t limit yourself to just social media, however. A full digital marketing plan should utilize banner ads, search engine optimization, and e-mail marketing to properly market your company to customers. Leading vendors are beginning to realize the value of hiring an employee solely dedicated to developing and managing the creation of content for a digital marketing campaign. Hiring an outside marketing agency to produce targeted content is also an option. While it can be difficult to generate a good return through social media, posting consistently and having targeted, specific, and measurable goals can produce results. Brands that consistently post engaging content and cultivate friendly and knowledgeable online personas can gain the trust of potential customers in ways that they couldn’t in the past. Trusted social media accounts attract more likes and gain more influence on social media, which can potentially lead to more companies who are interested in your services. Utilizing proven social media practices for your industry can ensure that you are the go-to company for AIDC services. To understand more about how you should be using social media for content marketing, take a look at this executive brief from VDC Research. Consider contacting Bluestar’s VARCOM services as well to help you navigate the Social Media landscape and create industry specific content.